Help protect the island from degradation by practing a no-trace ethic. Please...Take only memories, leave only footprints. Framed by the shimmering glacial water of Flathead Lake and the high-rising peaks of the Mission Mountains, Wild Horse Island is a rare image of the peaceful rhythms of nature. Exploration of its inner reaches reveals mature Douglas-fir and Ponderosa Pine forests as well as a last remnant of Montana's native grasslands, the Palouse Prairie. 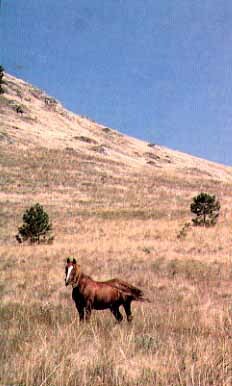 Wild Horse Island became a state park in 1978 through the cooperative efforts of Mr. MacDonald's family, The Nature Conservancy, and the State of Montana. Although 56 privately owned parcels still exist along the shore areas, most of the island, 2163 acres, is now state park. Over time Wild Horse Island has come to hold special meaning for those who have visited its rocky shores to hike, picnic, observe wildlife, swim, fish, or simply enjoy the peaceful solitude.